This is the second time in succession that the Mexican Presidential elections have been subject to fraud to benefit one of the parties of the right. In the latest poll, on July 1, it was to benefit the long-time ruling party the PRI (institutional Revolutionary Party) who had previously presided over more than 70 years of corruption and economic stagnation. 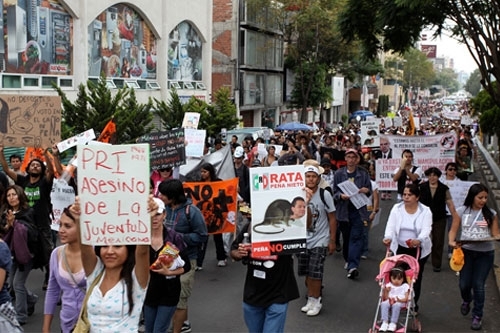 The PRI lost to another party of the right, PAN (National Action Party) in 2000 and the latter has since presided over more of the same and an escalating ‘war on drugs’ which has killed tens of thousands. This has led to a shift to the left in the form of increased support for the PRD (Party of the Democratic Revolution). In the 2006 elections widespread polling fraud led to an official declaration of a wafer thin majority for the PAN. This year the official margin of victory is much greater, 38.2% for the PRI and its TV-sponsored candidate Nieto versus 31.6% for the PRD, with the PAN trailing in at 25.4%. Mark Weisbrot and his colleagues at the Centre for Economic and Policy Research carried out a detailed analysis of a significant sample of the 2006 ballots (that the authorities’ were obliged to recount in response to widespread allegations of vote-rigging) and found that the PRI’s majority did not exist. At this year’s election it is widely acknowledged that the PRI benefited from media bias, especially the private TV stations. There are also numerous unchallenged reports of voters being handed store cards carrying a cash balance, groceries and other goods by PRI supporters. In response to the blatant media bias the student protest movement YoSoy#132 was launched and campaigned vigorously against the media’s favoured candidate – the PRI’s Nieto. The students along with PRD supporters and other citizens simply concerned at the alliance of anti-democratic forces that delivered the PRI its official victory, are now leading the protests in Mexico City. Meanwhile Nieto has appointed General Naranjo as special adviser on security. Naranjo was in charge of ‘Plan Colombia’ which, under the pretext of ‘the war on drugs’ began to turn Colombia into a base for US and national military forces to act as the US’s gendarme in the region. Protestors and socialists in Latin America and beyond will be aiming to stop a repeat of that operation in Mexico.